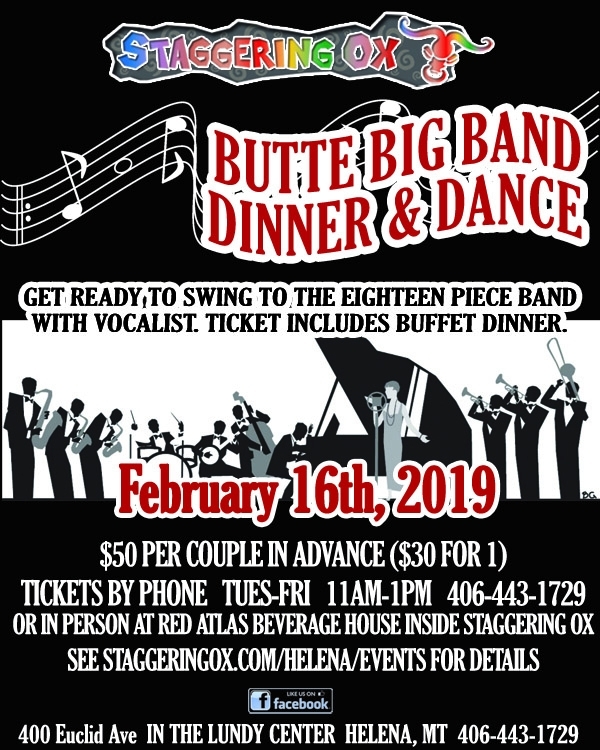 Helping us celebrate Lawrence Welk’s 116th Birthday, Butte Big Band will entertain us at the Staggering Ox in Helena with a night of that big band sound. 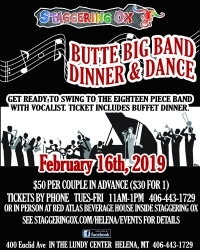 Enjoy a rare opportunity to see the full 18 piece band all dudded up in tuxes, plus a vocalist, and a dance floor...so get ready to swing! Tickets include Buffet Dinner and non-alcoholic beverages. Beer and Wine are available for purchase. -Buffet begins at 6:15pm (band will go through first). -Music begins approximately 6:45 until 9:45 or so. Tickets on sale at Staggering Ox in the back at the Red Atlas Beverage House. Advance tickets $30 for 1 or $50 for 2. Day of Show, $35 / $60 (NOTE: This show sold out several days ahead of time when we had it in 2016).